Copper Valley Road Race : Team Aggress! Only the toughest men from the AZ peloton came out on Saturday to compete in this grueling edition of the Copper Valley Road Race. With temperatures in the low 40’s and an 80% chance of rain, everyone knew what they were getting into. The course was a 60 mile out and back, with a 7 mile sustained climb at around 6% grade 20 miles from the finish on the way back. Bryan Schlegel was the lone Cat.3 from the team, and got himself off on a solo break on the way out. He had about a minute and a half gap when another racer bridged up to him from the main field. They started working together, but sadly Schlegel flatted. The wheel truck was behind the peloton, and his break was over. He made his way back into the group, they caught the soloist that had bridged to Schlegel earlier, and a break of 4 got away on the climb. 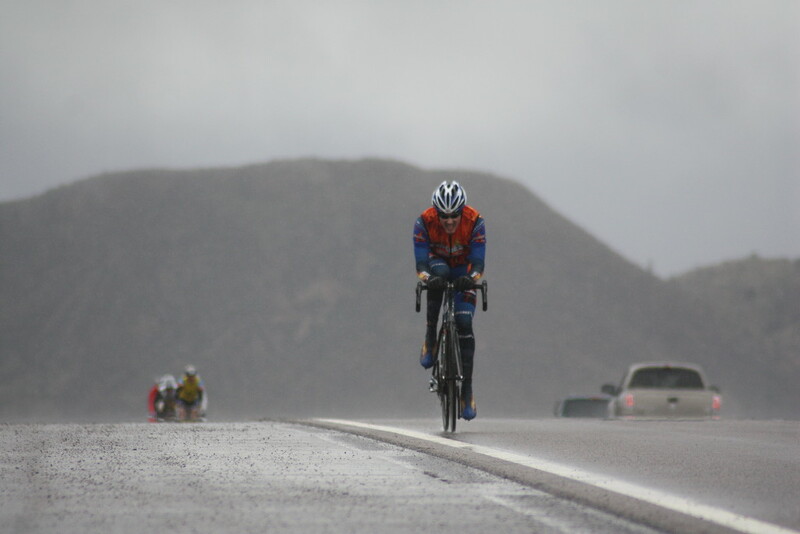 On the cold and wet descent towards the finish Schlegel made use of some superb aerodynamics, riding away from the peloton to a solo 5th place finish. The Cat.4 Aggressor strongmen were Kurt Garbe, Elliot Anderson, and Victor Riquelme.The peloton was shattered on the first climb, only 15 miles from the start. Riquelme made the selection, and sat in while the Bicycle Haus team kept the pace very high. At the base of the climb on the way back the chase groups all reconnected with peloton, and Kurt and Elliot were back in the stir. The group did not stay together for long, as the attacks began to pour on while the climb progressed. 8 men made the split. The group stayed together on the descent, and it came down to a drag race to the line. Riquelme finished 3rd, in what was a very closely contested sprint. Kurt and Elliot finished 10th and 14th, respectively. It was a long, cold, wet day for all of us. The effort put Aggress on the Cat.4 podium for the 3rd weekend in a row.